This species is a native of the Northern Territory, although it also occurs in Asia. There are some specimens of this tree near the entrance to the car park near DA1 as well as elsewhere. 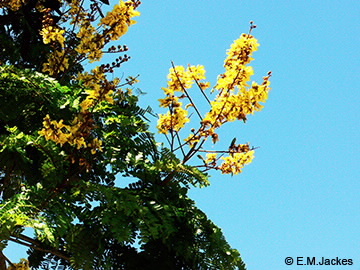 The tree produces racemes of yellow flowers followed by flat indehiscent coppery pods. Leaves are bipinnate. Fast growing it does not like cyclonic winds but if cut back and pulled upright will shoot readily. The timber can be used for furniture making and a brown dye can be extracted from the bark. This tree is a poor performer in strong winds.